A client needed to heat 0.06" (1.5 mm) stainless steel tubing to 1950 oF (1066 oC) prior to swaging or shaping. They turned to THE LAB at Ambrell to design a heating solution for their manufacturing process. 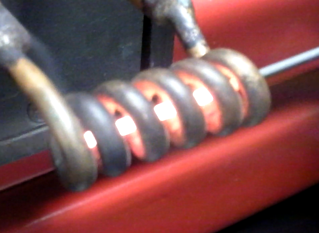 The objective was to heat the tubing to the targeted temperature within five seconds. The end product is used in the medical industry. THE LAB determined that an EASYHEAT 2.4 kW induction heating system with a multiple-turn helical coil would be optimal for their application. With the process designed by Ambrell's applications engineers, the part heated to temperature within five seconds. This result met the client's objective. Induction's rapid, repeatable heating was of particular value to the client. The versatility of Ambrell's EASYHEAT induction heating system along with its modest size were also key factors. And, of course, the capability of THE LAB to prove their application's viability before making a purchase set Ambrell apart. Free testing is available from THE LAB. So if you'd like to see if your process can benefit from induction heating from Ambrell -- or perhaps you're designing a new manufacturing line -- the engineers from Ambrell can help you.